My artwork explores the dissolution of material and figurative imagery, depicting the abstract essence and energy of life. I draw inspiration from my personal psychology. My mental health has given my life very difficult and also very beautiful moments. These are translated in my work through color, form as well as the physicality of paint. The repetitious layering of, taking away, and re-application of color underneath automatic scrawling, scratching and mark-making express my inner psyche – the way I think about myself and the world around me; This can be rough and harsh, and sometimes it is gentle and loving. I received my B.F.A. in painting and art history from Siena Heights University in 2007. I have been exhibiting my artwork throughout southeast MI for several years. Listen to Kelly's interview on her life and work as an artist on the Non-Members Podcast HERE. Kelly Burke's paintings compliment any space including homes, offices, corporate spaces, dining spaces, schools and many more! To inquire into a painting, request a commissioned piece, or schedule a *studio visit, please go here. HER PAINTINGS ARE CURRENTLY HOUSED IN PRIVATE COLLECTIONS IN NEW YORK, SAN FRANSISCO, MILWAUKEE, AND VARIOUS BUSINESSES, PRIVATE PRACTICES, AND PRIVATE RESIDENSCIES ACROSS METRO AND DOWTOWN DETROIT INCLUDING THE WESTIN BOOK CADILLAC HOTEL. *Serious collectors of original artworks are invited to schedule an appointment at Burke's private live/work studio. You Can't Touch a Ghost: Five Senses for a Cause! Artwork "She is All Around Us" given "Honorable Mention" award in painting category by Jurors. October 10th - November 30th, 2016. Biggest Show Ever at the Dancing Dog Gallery! Video Interview: Blick Art Materials Artists Serving Artist Series: Kelly Burke - Golden Artist Colors. Jan 18th, 2018. 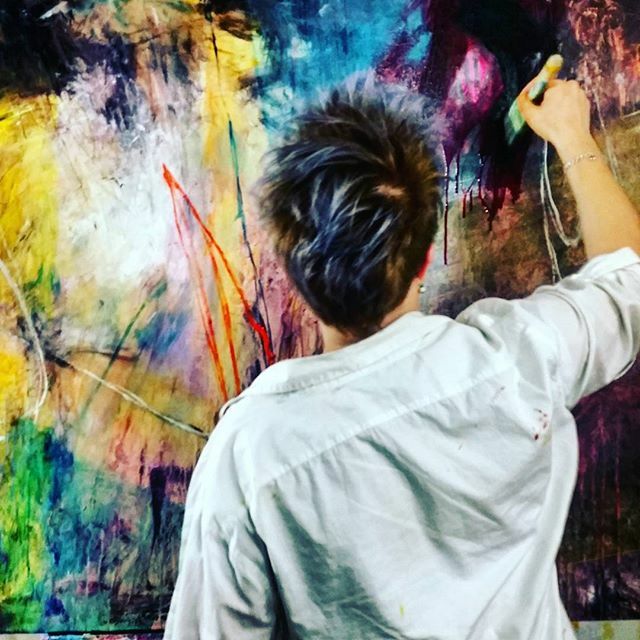 Podcast Interview : The Non-Members Podcast: Kelly Burke - Abstract Expressionist Painter. Janurary 30th, 2017. CLICK HERE TO LISTEN. "Alpha" painting featured in Eclipse; A Journal of Literature and the Fine Arts - Alumae Edition, October 2016.